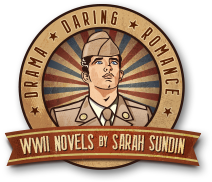 During World War II, rationing was a large part of life on the United States Home Front. Tires were the first items to be rationed. The Japanese conquered the prime rubber producing nations of Malaya and the Dutch East Indies from January to March of 1942, eliminating 91% of America’s rubber supply. Since cargo ships were needed for military purposes, the ability to import rubber from South America was reduced. The synthetic rubber program had just begun and didn’t produce enough to meet civilian and military needs. Before the war, the US had accumulated a stockpile of crude rubber – but only enough for one year at peace. In civilian life, three-quarters of rubber was used for automobile tires, but rubber was also used for gloves, raincoats, boots, waterproof sheets and baby pants, girdles, hot water bottles, bathing caps, garden hoses, and toys. The military required rubber for vehicle and aircraft tires, pontoon bridges, gas and oxygen masks, medical equipment, boots, raincoats, shoes, and even erasers. 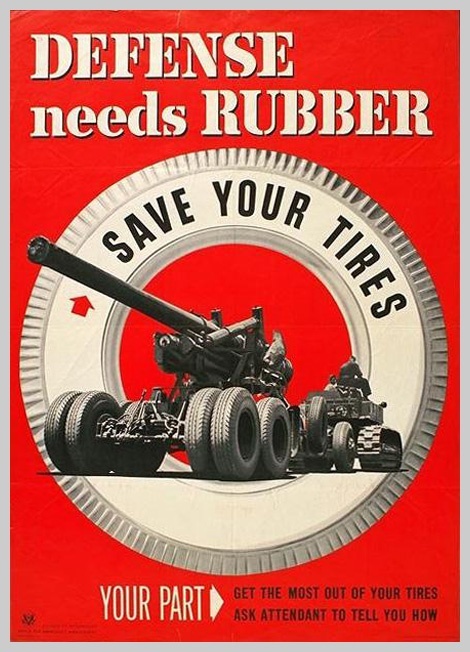 To ensure enough rubber for military and vital civilian purposes, rationing of tires and rubber goods was announced on December 27, 1941, to start on January 5, 1942. The program ran through December 31, 1945. Local Tire Rationing Boards issued certificates for tires or recapping upon application. Certificates for new tires were restricted to vehicles for public health and safety (medical, fire, police, garbage, and mail services), essential trucking (food, ice, fuel), and public transportation. Recapping was allowed at the discretion of the local board for any of the above, and occasionally for taxis and defense workers who shared rides. Civilians were allowed to keep five tires per automobile, and were required to surrender any others. Men’s rubber boots and work shoes were rationed starting September 30, 1942 (see Shoe Rationing in World War II), but most other civilian products made from rubber were no longer produced. People simply had to make do with what they had. Macy’s even canceled their traditional Thanksgiving Day parade from 1942 through 1944 to conserve rubber and helium. In November 1942, Macy’s ceremonially handed over their rubber balloons for the war effort. Public service campaigns educated people on how to care for rubber products to make them last for the duration – protection from heat and moisture, proper cleaning, avoiding folding or crumpling, careful stretching of elastic, and speedy repair of holes or tears. From June 15-30, 1942 the United States held a nationwide rubber drive. People were encouraged to donate used or surplus rubber items. People brought in old or excess tires, raincoats, hot water bottles, boots, and floor mats. In exchange they received a penny a pound. Although 450,000 tons of scrap rubber was collected, used rubber was found to be of poor quality for military use. Since civilians had to make five tires last the entire war, they had to be extremely careful. People were encouraged to drive less – in fact, the primary purpose for nationwide gasoline rationing was to protect tires. A “Victory Speed” of 35 mph was instituted – tires wore out half as quickly at 35 mph than at 60 mph. Slow and steady stops, starts, and turns also reduced wear on the treads. Everyone was encouraged to use public transportation, to share rides, and to avoid rough roads. Proper auto maintenance was more important than ever – brake adjustment, wheel alignment, tire inflation, tire rotation, and early repair of holes all prolonged wear. In addition, all auto racing was banned. How would you have handled tire rationing? Well, and think of how the tires were made back then too! Sheesh. Jaime – a lot of people brought their old buggies out of storage. I have a novelty song on a CD called “The Old Grey Mare is Not What She Used to Be,” which is about the old mare getting spoiled because she’s in demand again – how she “flips her tail at a Ford and a Pontiac,” and how her owner makes money hauling out-of-gas cars. It’s pretty cute. I remember my nanny singing that song to us. I forgot about that. Thanks for the memory and the history behind the song. I KNOW THAT SONG! My Gramma sang it all the time when she’d try to stand up after weeding in her garden and her knees cracked! LOL Now I know the history behind it. Love it. Never heard the history of that song, how interesting & fun! I had heard the chorus a lot when growing up, but never the entire song. Thank you.